There is no federal law that ensures all workers are able to earn paid sick days in the United States. For workers who fall ill or whose families depend on them to provide care in the event of an illness, this means sick days can be incredibly costly. Taking needed sick time means workers go without pay or must show up at work while sick and delay seeking treatment for themselves or their dependents. This paper examines recent trends in paid sick time and highlights some of the costs to workers and their families when they are not given the opportunity to earn paid sick time. By quantifying how lack of paid sick days threatens the economic security of low- and moderate-income families, it adds new data to debates over paid sick days measures in states and cities and the need for federal legislation. Over the last several years seven states, the District of Columbia, and 31 other localities have passed paid sick days laws, five of which are set to go into effect this July. Ballot initiatives are on the horizon and some policymakers are calling for a federal guarantee to allow workers to earn paid sick time. Lack of paid sick days is a real problem, particularly for low-wage workers, and it shows up in the large paid sick days gap between high- and low-wage workers. While approximately 64 percent of private-sector American workers currently have access to paid sick days, this topline number masks the fact that higher-wage workers have much greater access to paid sick days than lower-wage workers do: for example, 87 percent of private-sector workers in the top 10 percent of wages have the ability to earn paid sick days, compared with only 27 percent of private-sector workers in the bottom 10 percent. State laws providing the right to paid sick days appear to be having a small but meaningful effect as the share of workers with access to paid sick time has increased, particularly at the low end of the wage spectrum. Access to paid sick time for low-wage workers has increased since 2012, the year the first state law requiring paid sick days went into effect, in Connecticut. The share of low-wage, private-sector workers nationwide with paid sick time rose from 18 percent in 2012 to 27 percent in 2016, while the share of the top 10 percent of wage earners with this benefit has barely budged (86 to 87 percent over this period). Of all regions, the Pacific region had the biggest overall increase in access to paid sick days, with the share of workers with access rising from 63 percent in 2012 to 73 percent in 2016 (in contrast, the share nationwide rose from 61 to 64 percent during the same period). Paid sick days laws went into effect in 2015 in California and 2016 in Oregon (two of the three states in the Census-designated Pacific region). Approximately 64 percent of private-sector American workers currently have access to paid sick days, but this topline number masks the unequal distribution of this access among workers (U.S. DOL/BLS 2016a). 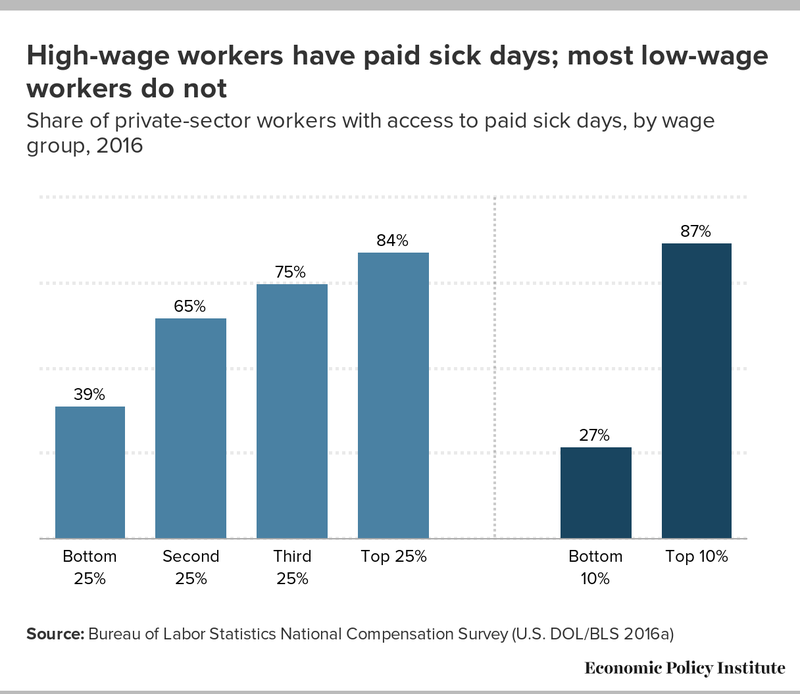 Access correlates with wages such that higher-wage workers also have better benefits, such as paid sick days, when compared with lower-wage workers. Among the 10 percent of private-sector workers with the highest wages, 87 percent have access to paid sick days (Figure A). By contrast, among the 10 percent of workers with the lowest wages, only 27 percent have access to paid sick days. Low-wage workers are least able to afford to absorb lost wages when they or their family members are sick. Similarly, access to paid sick days varies significantly by industry. As noted, 36 percent of private-sector employees nationwide cannot earn paid sick days. But, nearly twice that number, or 69 percent of lower-paid service workers in the accommodation and food services industries, lack access to paid sick days (U.S. DOL/BLS 2016a). “Presenteeism,” or working while sick, in the food services industry not only results in decreased productivity and increased risk of injury, but also poses a public health risk (Asfaw, Pana-Cryan, and Rosa 2012). Almost half of all restaurant-related foodborne illness outbreaks are attributed to employees coming to work while ill (Norton et al. 2015). A recent poll released by the National Partnership for Women & Families found that 70 percent of women surveyed in the fast-food industry within the last year reported going to work despite displaying symptoms of illness, including coughing, sneezing, fever, diarrhea, or vomiting (National Partnership 2016b). As noted, needed sick time deprives workers of pay or pushes them to show up on the job while sick and delay seeking treatment for themselves or their dependents. While the United States continues to be behind its international peers in providing this basic federal protection, many state and local policymakers understand both the public health risk of leaving workers little choice but to show up to work sick and the reality that lack of paid sick time imposes a disproportionate burden on lower-wage workers. Over the last several years, seven states, the District of Columbia, and 31 other localities have passed laws to grant workers this right (National Partnership 2016a). Currently, five states require employers to allow workers to accrue some minimum number of paid sick days, including Connecticut (since January 2012), California (since July 2015), Massachusetts (since July 2015), Oregon (since January 2016), and Vermont (since January 2017) (National Partnership 2016a). The District of Columbia has had a paid sick days law in effect since November 2008 (with amendments expanding the coverage of the law in 2014). Paid sick days laws will be implemented for the first time in Arizona and Washington in July 2017 and January 2018, respectively. California has already passed an expansion of its policy to include employees working for in-home supportive services, which will go into effect in 2018, and Vermont’s policy will extend eligibility to employees of small businesses in 2018. And at the time of publication, Rhode Island is working to pass paid sick days legislation to guarantee a minimum amount of paid time for eligible workers to care for themselves or family members when they are sick or seek medical care. Additional campaigns could increase that number significantly in coming years. For example, while Maryland’s governor recently vetoed the paid sick days legislation that passed both legislative houses, the Maryland legislature likely will try to override the veto after it opens session again in January 2018. In addition, 31 cities and counties have moved ahead to provide paid sick days to eligible workers. Paid sick days laws have gone into effect in most of those jurisdictions. In four jurisdictions—Minneapolis and St. Paul, Minnesota; and Cook County and Chicago, Illinois—sick days laws are scheduled to go into effect on July 1, 2017. While just a fraction of workers nationwide have benefited from these new laws so far, progress is being made. Since 2012, the number of private-sector workers with access to paid sick days has increased from 61 to 64 percent. Workers with lower wages, who generally have less access to paid sick days, have benefited disproportionately. In 2012, the year the first state’s (Connecticut’s) paid sick days law went into effect, 29 percent of workers in the bottom fourth of wages in the private-sector workforce nationwide had access to paid sick days (Figure B). That number stands at 39 percent today. Similarly, the percentage of workers in the bottom 10 percent of private-sector wages with access to paid sick days increased from 18 percent in 2012 to 27 percent in 2016. While the overall rate of access increased as well from 2012 to 2016, it was most pronounced in the Pacific region, where the percentage of private-sector workers with access to paid sick days increased from 63 to 73 percent during this period. This increase was most dramatic in 2016, the first full year for which paid sick days laws were in effect in California and Oregon (two of the three states in the Census-designated Pacific region). Earned sick time is a wise investment for employers, workers, and the general public. The many employers who already provide paid sick days would have a more level playing field with their competitors if more workers were given the opportunity to earn paid sick time. Additionally, businesses would be able to more easily maintain a healthy workplace. There are also implications for worker productivity. A 2003 study by Stewart et al. found that in 2003 productive time lost due to health conditions cost employers $1,685 per employee per year. While any new labor standard generates concerns about the business climate and job creation, the evidence from jurisdictions that have legislated earned paid sick days has been positive (National Partnership 2017a). The first jurisdiction to set a paid sick days standard was San Francisco, where employers have been required to allow employees to earn paid sick days since 2007. Fears that the law would impede job growth were never realized. In fact, during the five years following its implementation, employment in San Francisco grew twice as fast as in neighboring counties that had no paid sick days policy (Miller and Towne 2011). San Francisco’s job growth was faster even in the food service and hospitality sector, which is dominated by small businesses and viewed as vulnerable to additional costs, according to the Institute for Women’s Policy Research. The costs to business owners are practically negligible, but businesses and workers benefit from a more productive and healthier workforce (Drago and Lovell 2011). Connecticut became the first state to enact a sick days standard in 2011. Prior to its passage, Hall and Gould (2011) estimated the cost of allowing Connecticut employees to earn five days of paid sick time a year to be only 0.19 percent of sales, including firms of all sizes. For employers already providing five or more days of sick time, there would be no cost at all. In addition to the fact that any additional costs could be easily absorbed through small changes in other forms of compensation, hours, prices, or profits, earned sick time may actually save employers money through reduced turnover and higher productivity. The Connecticut law went into effect in 2012. A year and a half after the law took effect, researchers at the Center for Economic and Policy Research found that the law brought paid sick days to a large number of workers, particularly part-time workers, at little to no cost to business (Appelbaum et al. 2014). Also by mid-2013, more than three-quarters of employers expressed support for the law, the center found. Researchers have found similar results in other jurisdictions. In 2008, the District of Columbia approved the Accrued Sick and Safe Leave Act to allow district residents to earn paid sick days. In a recent survey, less than 10 percent of employers surveyed by the Office of the District of Columbia Auditor reported the new law has had a negative impact on profitability (ODCA 2015). In June 2013 New York City became the seventh jurisdiction to enable workers to earn paid sick days. Appelbaum and Milkman (2016) found that two years later, the law’s passage was supported by 86 percent of employers, and almost 85 percent reported the law had no effect on business costs, while providing an additional 1.4 million workers with paid sick days. Improving access to paid sick days would improve the economic security of working families and bring the United States more in line with its peers. Among the 15 economies designated as “highly competitive” by the World Economic Forum, only the United States fails to provide this basic protection (WORLD Policy Analysis Center 2016). Expanding access to paid sick days will mean stronger, healthier families. Working parents are often forced to choose between staying home with a sick child and going to work. When parents cannot take off work, children are sometimes sent to school ill, diminishing their learning experience and exposing other students, teachers, and staff to infection.1 When employees go to work sick, they endanger their own health and the health of their colleagues while jeopardizing their own safety and the quality of their work. At the same time, staying home and putting one’s own health first can result in overdue bills and not having enough food to eat. Earned paid sick days enable workers to avoid an unfair choice between going to work sick or going without pay (and maybe even losing a job). Notes: The first column is a selected list of household expenditures. The second column displays the average monthly household expenditures on this selected set of goods for a household earning between $40,000 and $49,999 per year, the range in which a household with two adults working full time at $12 per hour would fall ($12 per hour x 2 adults x 2,080 hours = $49,920). The third column illustrates the number of unpaid sick days that could put each expenditure at risk. 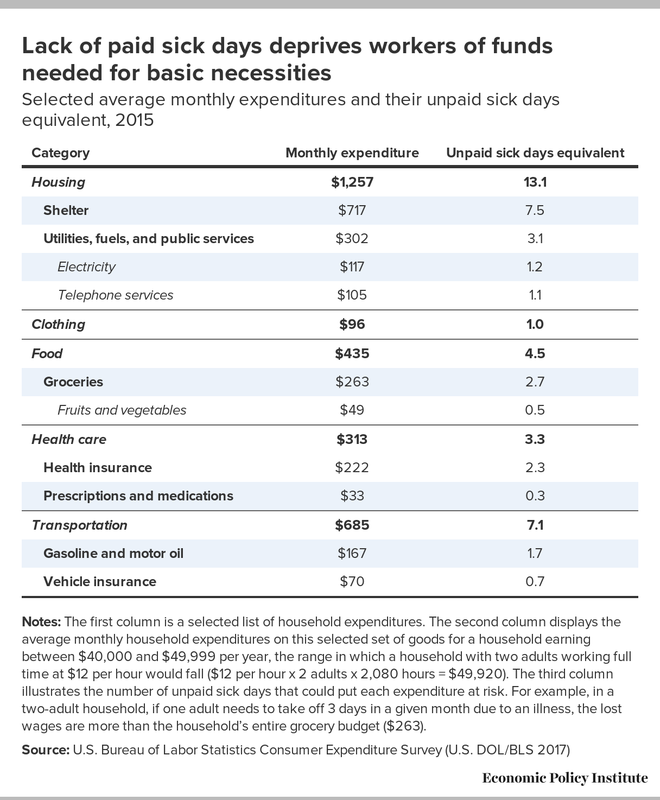 For example, in a two-adult household, if one adult needs to take off 3 days in a given month due to an illness, the lost wages are more than the household’s entire grocery budget ($263). If a worker needs to take off even a half day due to illness, the lost wages are equivalent to the household’s monthly spending for fruits and vegetables; lost wages from taking off nearly three days equal their entire grocery budget for the month. Two days of unpaid sick time are more than the equivalent of a month’s worth of gas, making it difficult to get to work, while an additional six hours not worked are equivalent to a monthly car insurance premium. Three days of unpaid sick time translate into the household’s monthly utilities budget, potentially cutting off electricity or heat to the family’s home. Taking three days to recuperate or to care for a sick family member means the worker may have difficulty paying for health insurance or keeping up with medical bills. Cutting back on health care at a time when it is most needed puts the worker’s family at further risk in the future in terms of both health and economic security. This tradeoff—reduced income and risk of losing a job because of a short-term illness—doesn’t arise for workers with paid sick time. A related but different issue arises when workers face a lengthier illness; paid family and medical leave could help fill in these larger gaps, but unfortunately workers across the board are even less likely to earn that benefit (Appelbaum 2016). Even with another wage earner at home working full time, a household could lose the necessary monthly income to pay for their entire rent or mortgage if one worker takes just seven and a half days of sick time. For the millions of workers without access to paid sick days, many workers who are sick feel forced to go to work, where they are less likely to be productive and more prone to mistakes. The income security provided by paid sick days allows workers to rest, get the health care they need, and fully recover from an illness before returning to work. Also important, it allows workers to continue paying their monthly bills, even in the event of illness. This economic security is incredibly important for low-wage workers and their families, given that the vast majority of low-wage workers do not currently have access to paid sick time. State and local measures are critical but the problem calls for a national solution—especially given impending state attacks on the right of localities to legislate these protections (National Partnership 2017b). This year paid sick days protections were provided to the federal contractor workforce, guaranteeing the ability to earn (or expand) paid sick days to an estimated one million private-sector workers (Gould 2017). But efforts to reach the overall workforce have yet to succeed. The Healthy Families Act, first introduced in 2004, would allow workers in workplaces with 15 or more employees to earn at least one hour of paid sick time per 30 hours worked, among other provisions. While Congress has reintroduced the Healthy Families Act with stronger sponsorship than before, the act is not expected to advance. More action is needed to reach workers across the economy regardless of their wage levels, hours, or where their jobs are located. Elise Gould, senior economist, joined EPI in 2003. Her research areas include wages, poverty, economic mobility, and health care. She is a co-author of The State of Working America, 12th Edition. She also authored a chapter on health in The State of Working America 2008/09 and co-authored a book on health insurance coverage in retirement. She has published in venues such as The Chronicle of Higher Education, Challenge Magazine, and Tax Notes; and has written for academic journals including Health Economics, Health Affairs, Journal of Aging and Social Policy, Risk Management & Insurance Review, Environmental Health Perspectives, and International Journal of Health Services. She holds a master’s degree in public affairs from the University of Texas at Austin and a Ph.D. in economics from the University of Wisconsin at Madison. Jessica Schieder joined EPI in 2015. As a research assistant, she supports the research of EPI’s economists on topics such as the labor market, wage trends, executive compensation, and inequality. Prior to joining EPI, Schieder worked at the Center for Effective Government (formerly OMB Watch) as a revenue and spending policies analyst, where she examined how budget and tax policy decisions impact working families. She holds a bachelor’s degree in international political economy from Georgetown University. 1. See, for example, Cunha 2014. 2. This is based on the average hourly wage of a worker without access to paid sick time. Whereas the average wage of a worker with access to paid sick time is approximately $18 per hour, the average wage of a worker without access to paid sick time is $12 per hour. To the extent that we are overestimating actual work hours or wages, workers would have less to lose but also less in earnings to make ends meet in general. Appelbaum, Eileen. 2016. “The Universal Paid Leave Act of 2015.” Written testimony, January 14. Appelbaum, Eileen, and Ruth Milkman. 2016. No Big Deal: The Impact of New York City’s Paid Sick Days Law on Employers. Center for Economic and Policy Research. Appelbaum, Eileen, Ruth Milkman, Luke Elliott, and Teresa Kroeger. 2014. Good for Business? Connecticut’s Paid Sick Leave Law. Center for Economic and Policy Research. Asfaw, Abay, Regina Pana-Cryan, and Roger Rosa. 2012. “Paid Sick Leave and Nonfatal Occupational Injuries.”American Journal of Public Health vol. 102, no. 9, e59–e64. Cunha, Darlena. 2014. “Kids Come to School Sick Because We Can’t Stay Home from Work.” Washington Post, October 14. Drago, Robert, and Vicky Lovell. 2011. San Francisco’s Paid Sick Leave Ordinance: Outcomes for Employers and Employees. Institute for Women’s Policy Research, April. Gould, Elise. 2017. “Paid Sick Leave Provides Economic and Health Security to Over a Million Federal Contract Workers.” Working Economics (Economic Policy Institute blog), January 17. Hall, Douglas, and Elise Gould, 2011. “Paid Sick Days: Measuring the Small Costs for Connecticut Businesses.” Economic Policy Institute Policy Memo no. 177. Miller, Kevin, and Sarah Towne. 2011. “San Francisco Employment Growth Remains Stronger with Paid Sick Days Law Than Surrounding Counties” [fact sheet]. Institute for Women’s Policy Research. National Partnership for Women & Families. 2016a. “Current Paid Sick Days Laws.” November 9. National Partnership for Women & Families. 2016b. “Most Women in Fast Food Industry Cannot Earn Paid Sick Time, Have Gone to Work with ‘Troubling Symptoms,’ Survey Finds” [press release]. November 22. Workers, Employers and Communities.” Fact sheet. National Partnership for Women & Families, 2017b. “Paid Sick Days Preemption Bills (Current Session)” [interactive map], last updated May. Norton, D.M., et al. 2015. “Managerial Practices regarding Workers Working while Ill.” Journal of Food Protection vol. 78, no. 1, 187–195. doi:10.4315/0362-028X.JFP-14-134. Stewart, Walter, Judith Ricci, Elsbeth Chee, and David Morganstein. 2003. “Lost Productive Work Time Costs from Health Conditions in the United States: Results from the American Productivity Audit.” Journal of Occupational and Environmental Medicine vol. 45, no. 12, 1234–1246. U.S. Department of Health and Human Services (U.S. DHHS), Agency for Healthcare Research and Quality (AHRQ). 2015. Medical Expenditure Panel Survey [database]. U.S. Department of Labor (DOL), Bureau of Labor Statistics (BLS). 2016a. National Compensation Survey: Employee Benefits in the United States, March 2016. U.S. Department of Labor (DOL), Bureau of Labor Statistics (BLS). 2016b. National Compensation Survey [public data series]. U.S. Department of Labor (DOL), Bureau of Labor Statistics (BLS). 2017. Consumer Expenditures in 2015. Report 1066. WORLD Policy Analysis Center. 2016. “Paid Sick Leave: Is It Feasible for National Economies to Be Competitive while Guaranteeing It?” [fact sheet]. April.